Corrosive liquids are hazardous. These could be acids with a pH of below 2 or bases with a pH above 12.5. Either way, corrosives have the potential to eat away metal components. It’s not just the liquid that is corrosive. Fumes of these chemicals combine with humidity to condense onto metal surfaces. As the moisture evaporates, a corrosive residue remains behind. Corrosive chemicals are also notorious for their reactions with other chemicals. Oxidizers release oxygen, increasing the likelihood of an explosion or fire when mixed with other chemicals. Segregation of incompatible chemicals is critical to safe storage practices. Consult the Safety Data Sheet (SDS) of a chemical to learn any compatibility issues. 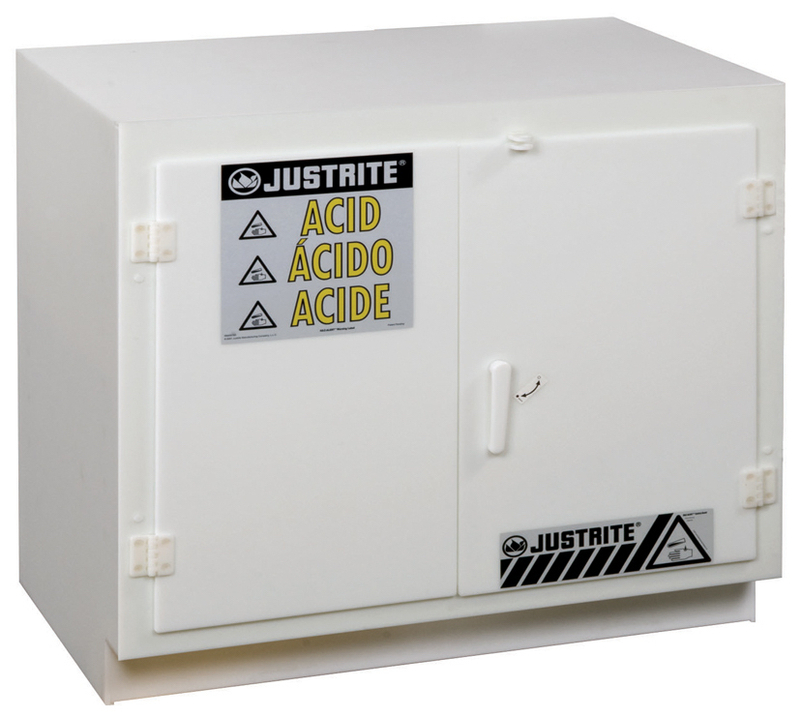 Justrite supplies Document Storage Boxes for storing SDS documents. Mount on your chemical storage cabinet to ensure users have the information they need close at hand. 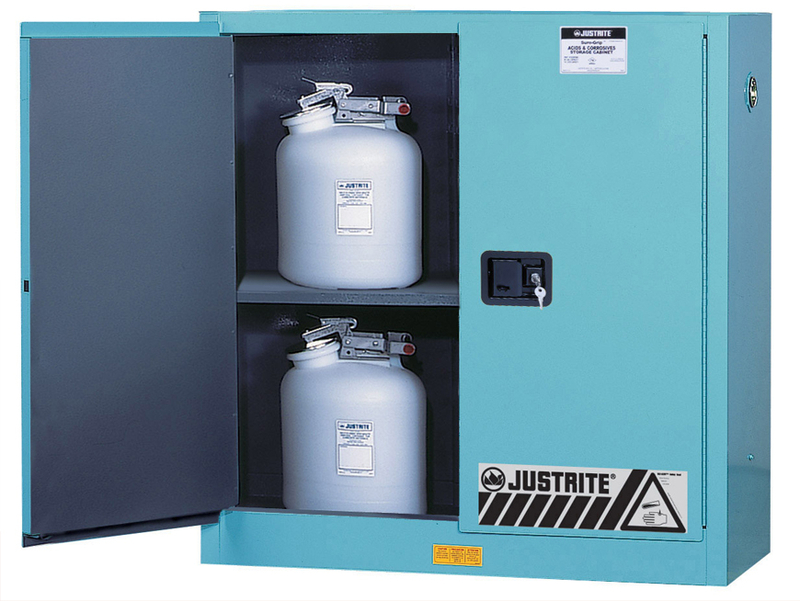 How can you mitigate chemical risks when selecting a corrosive storage cabinet? Follow these 3 tips from the experts. 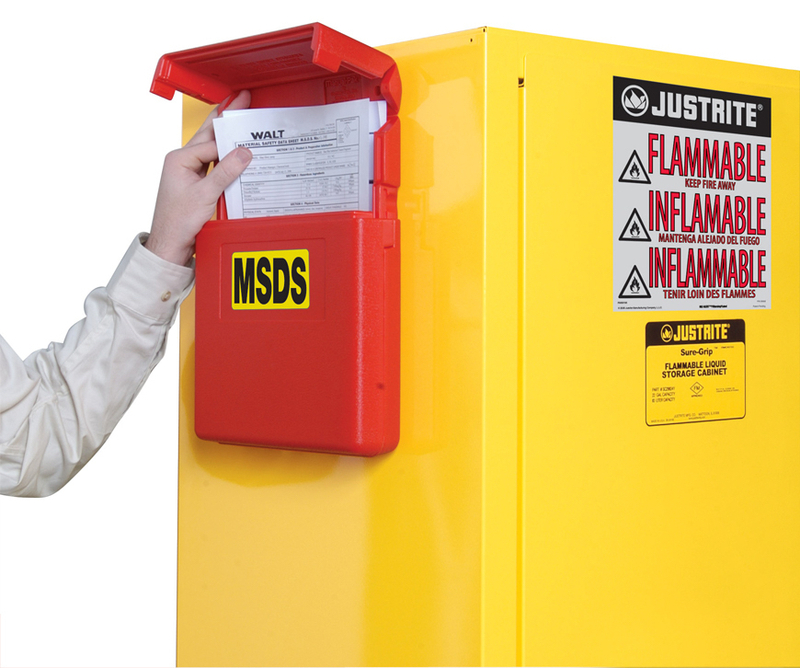 Store flammable corrosive chemicals in a Sure-Grip EX Safety Cabinets for Corrosives. These meet OSHA and NFPA standards for flammable liquid storage. Double-wall steel construction with an air space resists the heat of a fire, keeping chemicals safe. Baked on epoxy coatings further protect steel surfaces from chemical spills. These cabinets can also be specified as combo units, where an inner double wall partition separates two independent storage compartments. One side is for corrosives with a polyethylene sump liner. The other side is a standard flammable storage compartment. 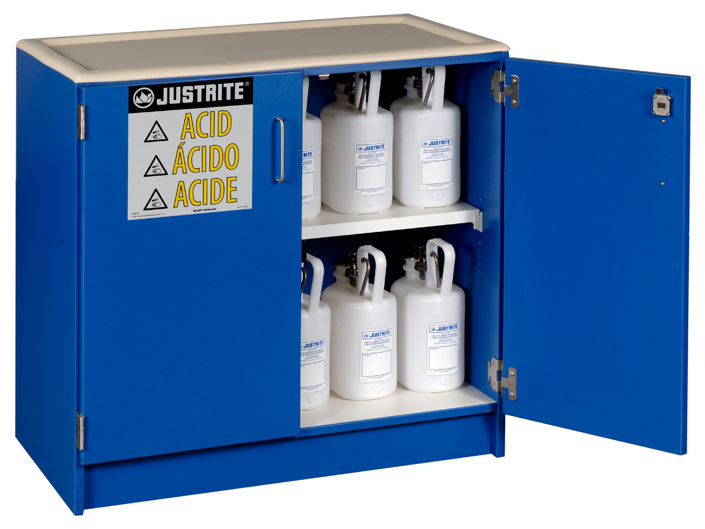 Justrite’s ChemCor Lined Safety Cabinets for Corrosives features a thermoplastic coating inside the cabinet. This seamless liner provides enhanced corrosion protection when dealing with highly corrosive materials. Corrosive chemicals that are not flammable, do not need double-steel wall safety cabinets. 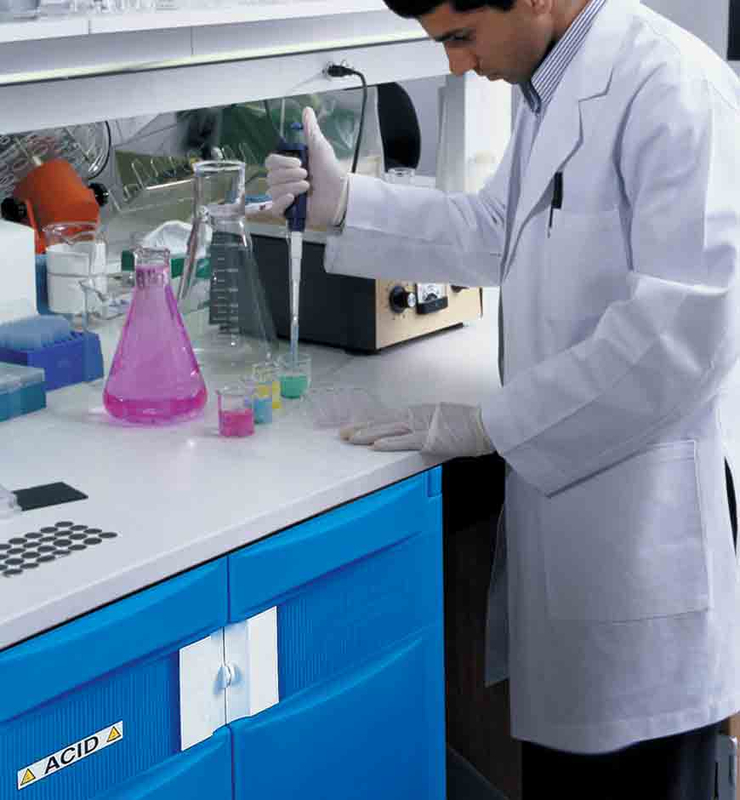 Molded polyethylene cabinets are impervious to the corrosive effects of harsh acids or bases. Spill catching trays capture spills and leaks and are removable for easy cleaning. Likewise, removable sumps help in cleaning larger spills. Polyethylene cabinets feature no metal parts. This ensures a long life in corrosive chemical service. Though not suitable for storing flammable liquids, wooden cabinets provide excellent strength for storing corrosives. Their laminate finish offers a high level of chemical durability. Stainless steel hinges and handles ensure resistance to chemical damage. Do you need to store flammables and corrosives in a single cabinet? Do you need a high-strength cabinet for corrosives alone? Whatever your requirements, Justrite has the product to meet your needs. Our cabinets meet OSHA and NFPA standards, providing peace of mind that your corrosive chemicals are safe. Find your corrosive cabinet here.